After the last two days and late nights, this pilgrim lamb is exhausted!! I decided to do a fast, no-brainer chibi experiment using the Bee Paper Co. Bogus Rough Recycled Sketch paper (what a looong name!) in my Chameleon Notebook. 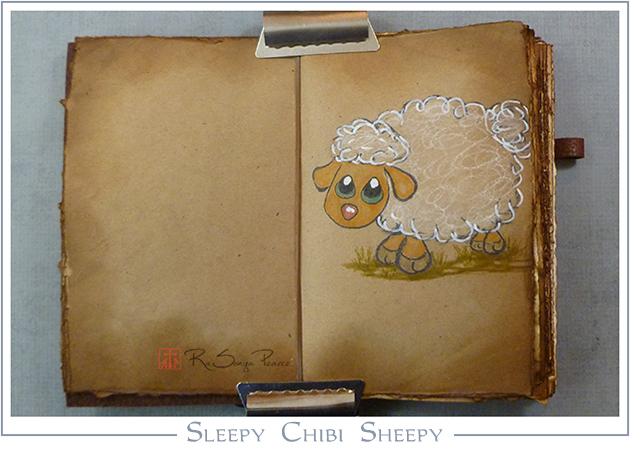 This sleepy chibi sheepy was drawn with my new Copic Brush Pen. The Copic is a very nice brush pen that so far feels almost exactly like The Pentel Pocket Brush pen. The Pentel is easier to find and refillable, so I probably won’t repurchase the Copic. I colored the chibi with Tim Holz Distress Markers and Tombow Dual Brush Markers- both brands are watersoluble. They worked very nicely on toned paper, a fun change of pace and medium. 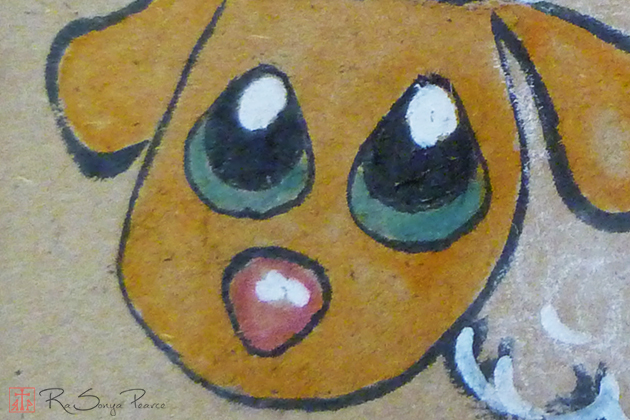 The white highlights and outline were made with a white Faber-Castell Pitt pen in the big marker size. LOVELY pen. The white covers the toned paper beautifully. As a final touch, I added a bit of white chalk. It wasn’t the usual paper or mediums that I choose for making chibi cartoons, but it was fast and fun. Just what I needed so I can get to bed and SLEEP!! !